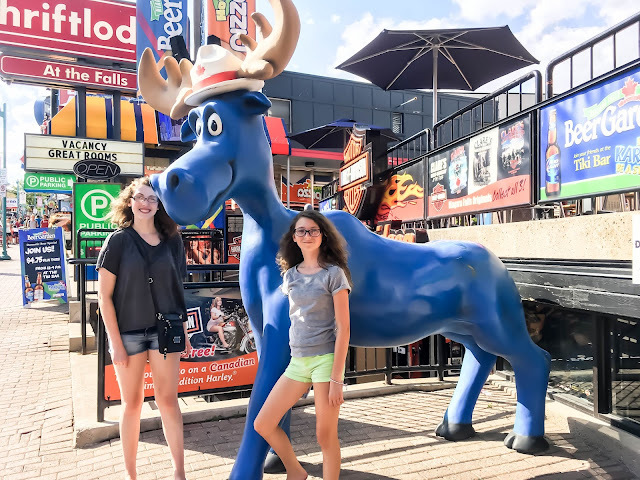 We decided to play tourist in Canada this summer, and since we were driving up, we kicked off the leg of our trip with a visit to beautiful Niagara Falls. Taking in the falls from the U.S. side did have a little beauty to admire, but left us feeling a bit unimpressed. To get a better view, we hopped on the bridge connecting U.S. to Canada. 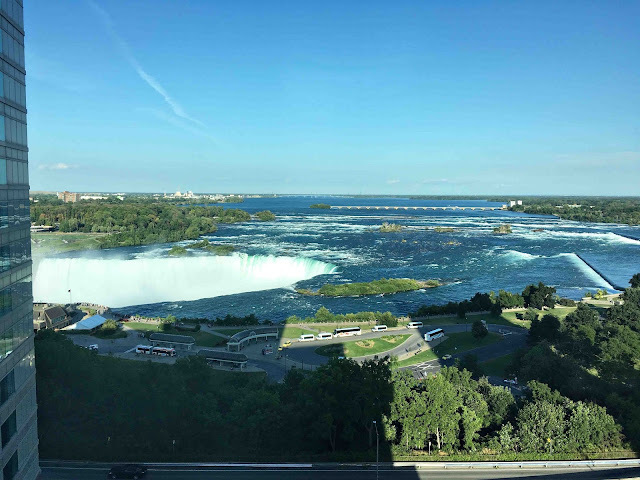 Here you could get a much better view of the falls without leaving the country. However, we did continue through the Canadian side on foot over the bridge. If you decide to do this, here's a tip. Bring Quarters! We didn't realize we were going to have to pay a 50¢ toll per person to come back into the U.S. and they do not accept credit cards. We had to leave the bridge crossing to find an ATM machine just so we could come back home. On the Canadian side, we walked the pathways taking in all the beauty that Niagara Falls had to offer. We did the touristy thing and decided to board the boats for an up close and personal encounter. We paid about $75 for 1 child and 3 adult tickets. 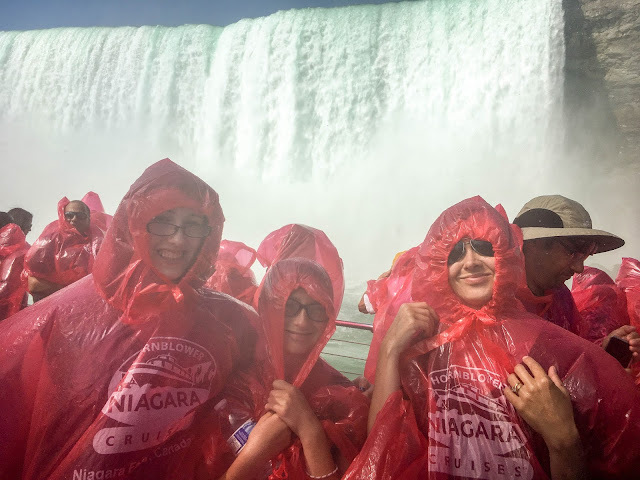 You do get a free poncho with the ticket purchase, but it is pretty flimsy and unless you have it tied super tight, you're going to get soaked! The mist is really powerful and made it hard to see, but once you pull away from the rushing water, you get such an incredible view! Curly girlies- Don't bother with the hair straightener before heading out. It won't last! Jason was encouraged to get a hotel with a view of the falls. He thought the girls would find it fascinating, but in all honesty, they looked out the window for about 5 minutes and were over it. If you are going to spend all day admiring it on foot, I really wouldn't suggest forking out the exorbitant fees they charge for a room with a view. After resting our feet for a bit and grabbing dinner, we went back down to see the beauty at night. 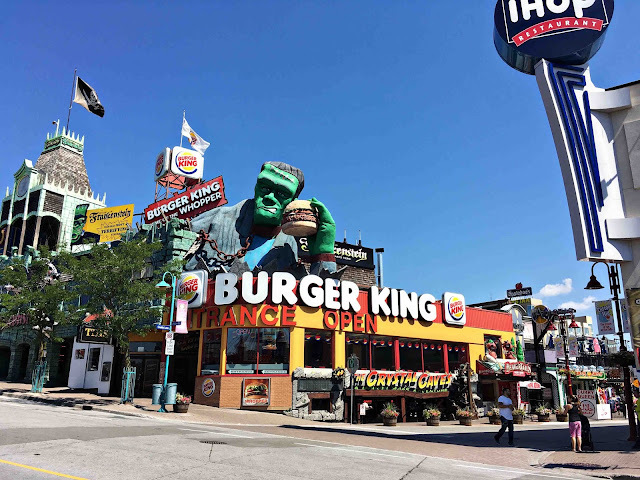 When you've had your fill of the falls, walk over to the strip for more fun. It kind of reminds me of a mini carnival town, with lots of eateries, shops, and haunted houses. All in all, it was a fabulous way to start off our vacation! Have you been to Niagara Falls? If not, is it on your travel bucket list? Sounds that you all had a wonderful time. 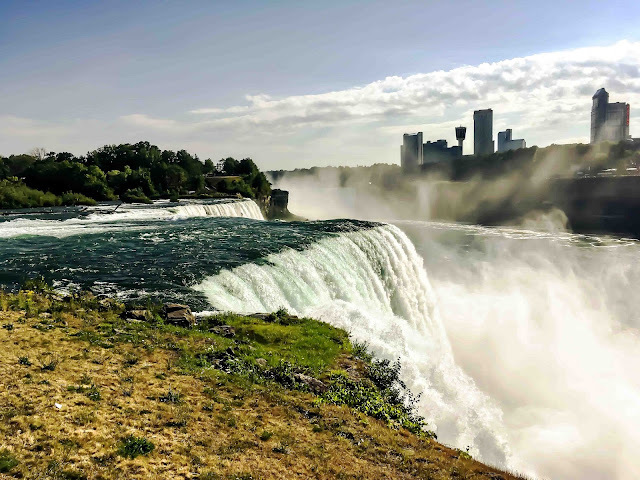 Falls looks very beautiful in the photos you have capture. Thank you! It really was a memorable experience. OMG I did not know you visited Niagara to in Canada! Such loveliness! I was about to ask if you wore those plastic bags over yourself and then I saw the photo :) I'm guessing Jason was the only one whose hair didn't curl up :P Is it terribly deafening down there? Yes, it is really loud when the boat gets close to the falls. And blinding too with all the mist floating around. I couldn't believe people were snapping photos with their iPads and phones that didn't have waterproof cases on them. I had one on mine and was still terrified it was going to get ruined. 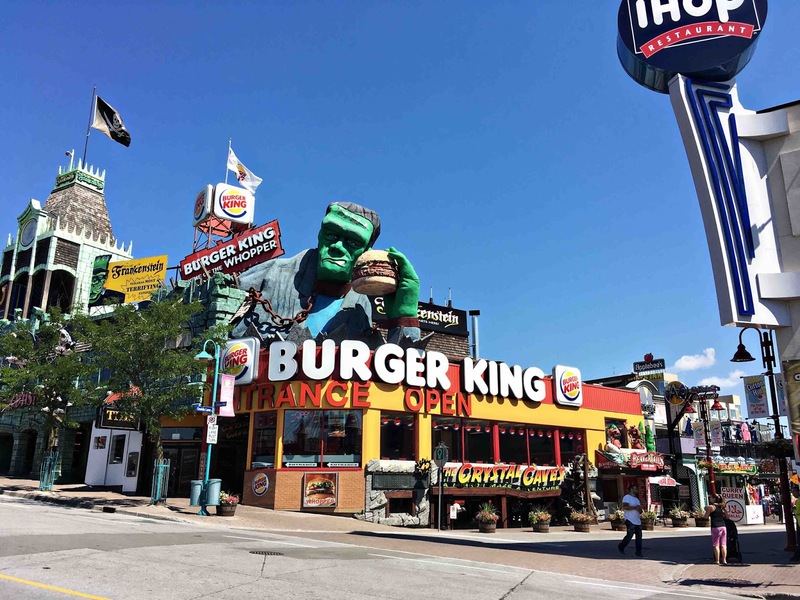 You know I'd definitely like to go during Halloween! Maybe you and Daisy could make a trip for an anniversary some day? It looks like you had a ton of fun! 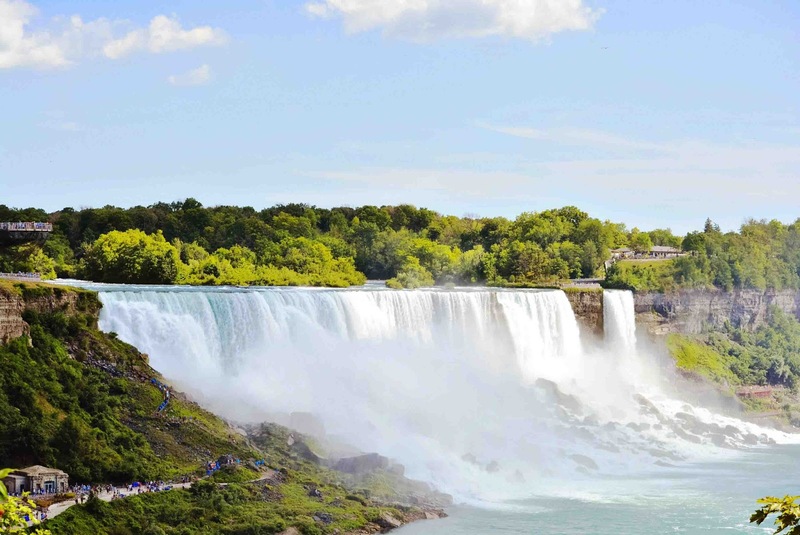 Niagara Falls looks like such a beautiful place to visit. I'm sure my family would love it! It sounds like you guys had a fantastic time. I've always wanted to see Niagara Falls. It's so huge and majestic. 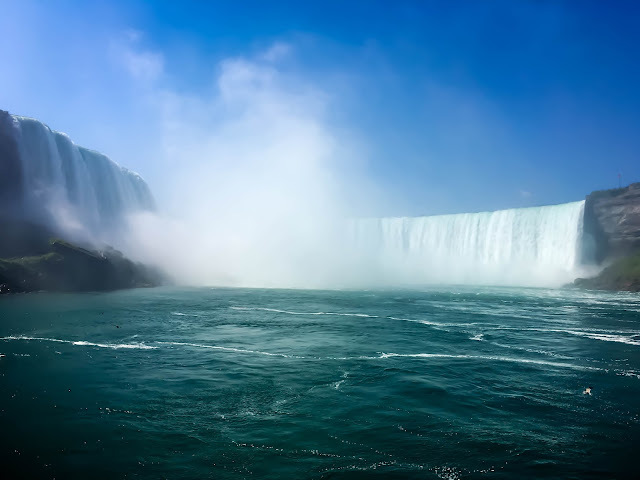 Niagara Falls has to be one of the most spectacular sights in North America. I'd love to see it for myself one day! What a beautiful sight to see in person. Visiting Niagara Falls is in my top 5 places that I want to visit. I have always wanted to visit Niagara Falls. It looks so pretty in pictures and I bet it is even more impressive in person. Goodness, I have not been to Niagara Falls in years! We had so much fun too! I need to take my kids there soon! Wow, the falls are so WIDE! I had no idea the real expanse of it all. 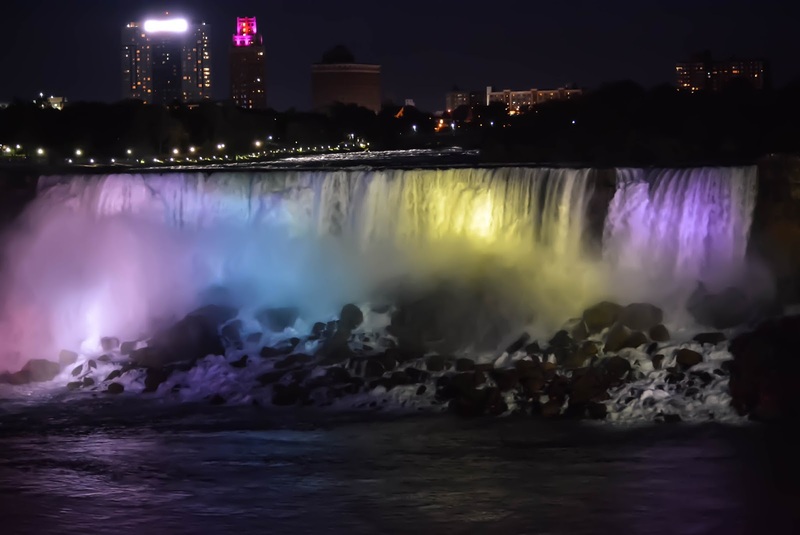 I would love to visit Niagra Falls and your post just totally made me want to plan a trip even more! I feel like seeing it during both the day and night hours is a must. Oh what a lovely time! There is nothing like those falls. They looked so pretty at night. Oh boy this is so pretty! I've never been there, but I'd love to go. I like that you took your kids when they were older. That way they'll remember the trip. None of us have passports, so if we go outside the US that will be a big fee to consider. I don't even know how much a passport is, or even where to get one. Can you tell I don't get out much? Such pretty photos you got! I love them all! We never traveled when they were little because we didn't want to waste money on trips they wouldn't remember. 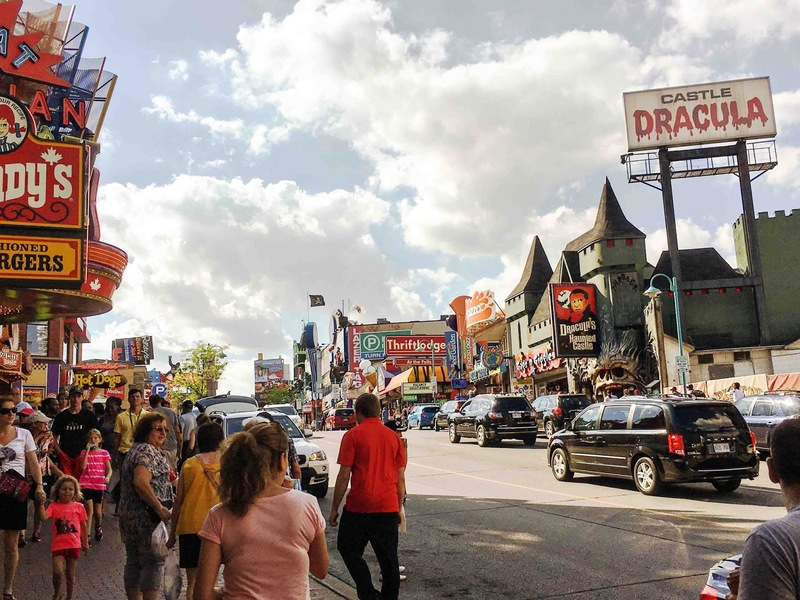 I like that we waited to do Disney, Smokey Mountains, Niagara and Canada when they were older. Not only will they remember, we don't have to deal with temper tantrums either lol. We didn't buy a full blown passport. Allison didn't need anything except for her birth certificate because of her age. Mariah and I opted to get the passport cards which cost about $50 each + a small processing fee/photo fee. This can all be done at your local post office. They send the paperwork in, then you get your cards in about a month. It really was super easy to do! Oh, the cards are good to travel in Canada, Pueto Rico, the Caribbean, and Mexico, but all by car or boat. You can't board a plane with the cards. You have to get the book for that, and I believe the book is $150 but it's good worldwide. I was at Niagra Falls once and I'm dying to go back. It is beautiful! 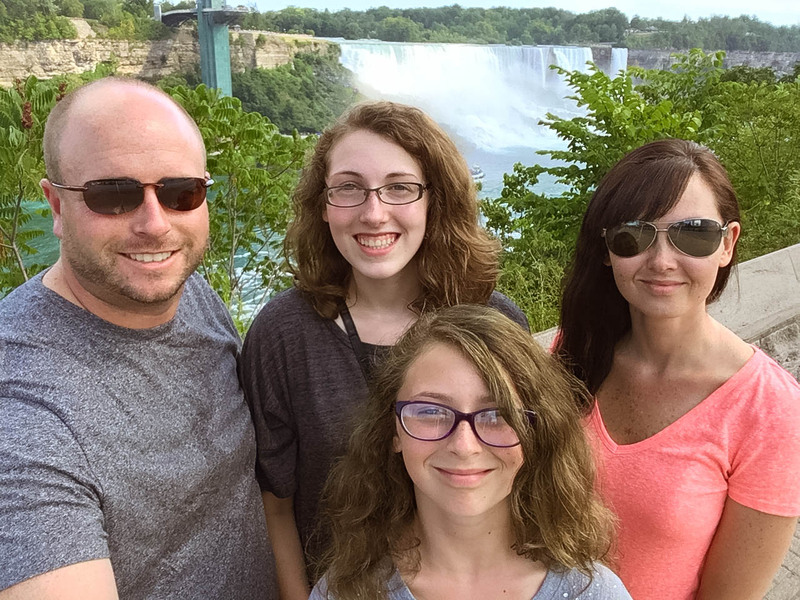 We are planning on visiting Niagara Falls sometime this year. It's going to be a family trip. I am looking forward to the amazing photos and memories. A bucket list spot for sure! You really have some great photos ! Looks like a great place for the whole family. This place is so on my bucket list. I've seen so many of my friends so there this summer. Your photos are beautiful! You're so lucky! My husband grew up near there but never got to go, sadly. I about blew my eyes out in surprise to hear he never went! I want to go! I've been to Niagara Falls area, but never actually saw the falls. I really regret it now. Wow, I have always wanted to visit Niagara Falls. It is so beautiful, calming. This place is magical. I always wanted to go there, my aunts lived in Alberta and I wish I can visit them. 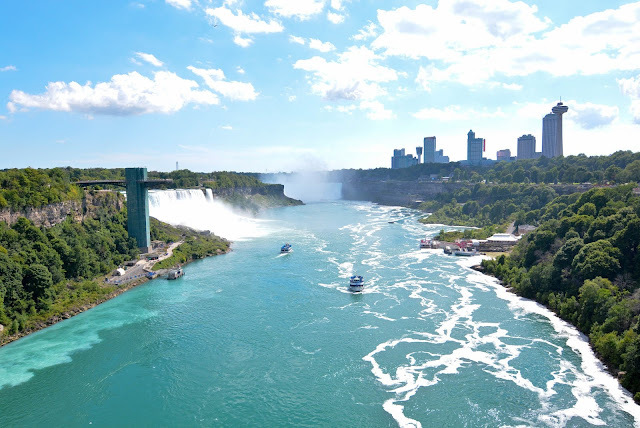 I have for a long while been itching to visit Niagara Falls. It looks so lovely in pictures...This spot is magical...i like it a debt of gratitude is in order for offer..
Fabulous indeed! I love how you were able to capture the best shots and a night view as a bonus. I think you've done well in enticing people to go there because it certainly worked for me! I've never been to Niagra Falls but would love to someday. You took beautiful pics of the Falls. 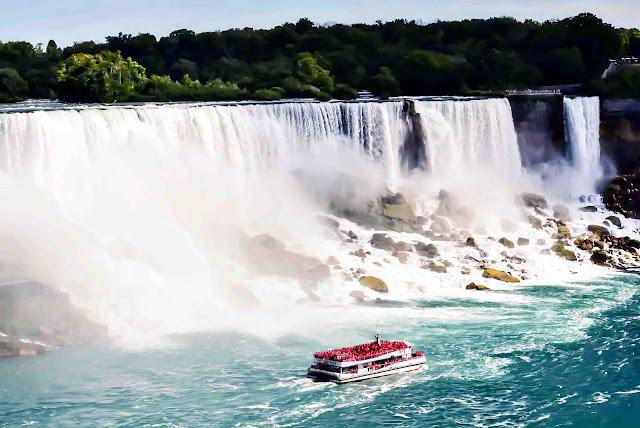 This highly rated 9-hour trip niagarafalls@zoomtours will show all points of interest on the Canadian side of Niagara Falls.